Here’s a satisfyingly healthy cream of broccoli cheese soup, that’s just as delicious at it is nutritious. Filling enough to be a main course, especially when served with some whole grain bread and/or a salad, this healthy cream of broccoli cheese soup was a big hit here. It’s super thick and creamy. Brimming with broccoli, potatoes and cheese and pureed until smooth. A simple one-pot meal that can be ready in about 30 minutes that your whole family will love. Even people who don’t like broccoli will like this healthy cream of broccoli cheddar soup – making it a great way to get all of broccoli’s health benefits in a bowl. 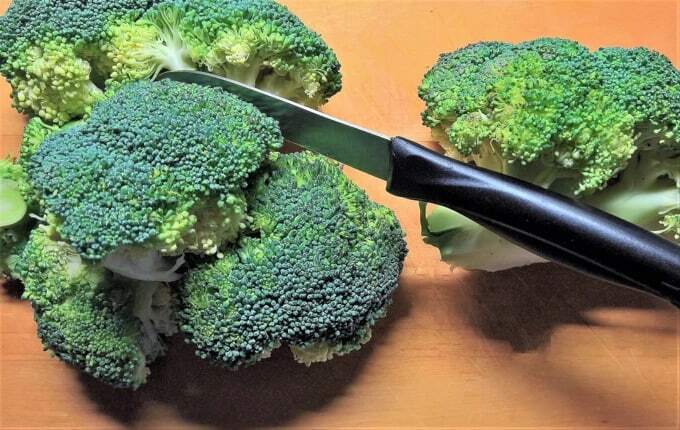 Broccoli is naturally low in calories and a great source of vitamins, minerals and fiber. I read recently that the French have soup for supper quite often – another French weight loss secret worth copying – I think. You can serve this savory soup with a sprinkling of shredded reduced-fat cheddar cheese, a dollop of yogurt and/or a sprinkling of sliced scallions or chopped basil. For a quick and easy lunch or dinner on the go, why not make a big batch and then freeze it in individual portions that you can microwave as needed? According to my calculations, each generous portion of this stovetop broccoli cheddar soup has about 280 calories, *7 Weight Watchers PointsPlus, *8 WW Freestyle SmartPoints. 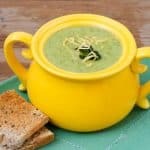 If you’ve made this Cream of Broccoli Cheese Soup, please give the recipe a star rating below and leave a comment letting me know how you liked it. 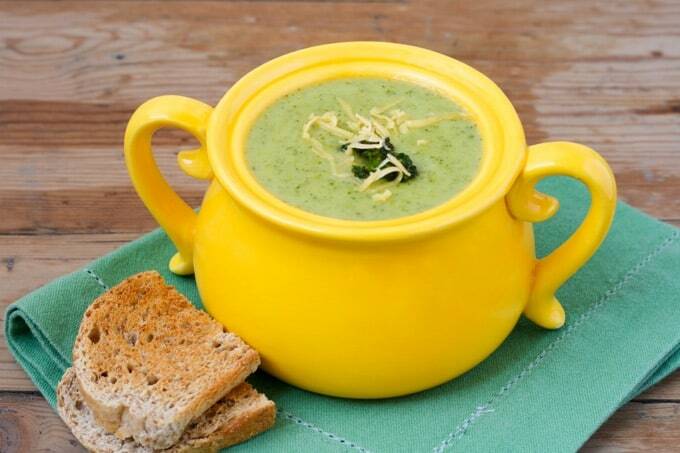 This simple, lightened up cream of broccoli cheese soup is sure to please your entire family! Spray a large nonstick soup pot or Dutch oven with nonstick cooking spray. Add the onion and cook over medium heat, stirring often, until the onion begins to soften, about 5 minutes. Add the broccoli, potatoes, carrot, broth and basil. Turn up the heat and bring to a boil then turn the heat to low and simmer, with the pot covered, until the vegetables are tender, about 20 minutes. Pour the puree back into the soup pot. Add the milk and stir occasionally until heated through. Remove pan from the heat and let cool for about 1 minute. Add the cheese and stir until it's melted. Adjust salt and freshly ground black pepper to taste. I used 1 can of evaporated skim milk and 1-1/2 cups fresh skim milk. The evaporated milk adds some richness without extra fat. If the soup seems too thick, you can thin it with a little more milk. For a chunkier soup, just puree part of the soup. Thank you so much for sharing this healthy soup recipe.